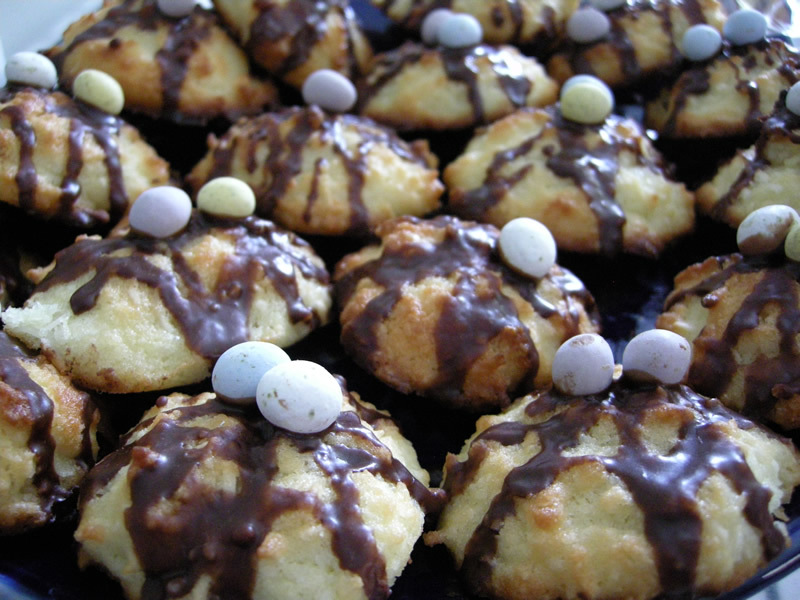 This is an adaption of a recipe which I found while on a search for coconut flour recipes, and I gave it an Easter twist. It's quick and easy and the macaroons are popular with wheat eaters too! * for a dairy free version, leave out the butter. Heat oven to 375 F (175 C). Mix melted butter/oil together with sugar, eggs and almond extract. Stir in flour and grated coconut. Let batter rest for 5 minutes and then drop heaped tsp mounds 1 inch aprt onto a greased cookie sheet/baking tray. Bake for 15 minutes or until browned. Makes 12 macaroons (aprox). Once cooled I decorated them with a chocolate glaze and mini eggs. They were really enjoyed by everyone! They are also good just plain without the chocolate, and can be frozen and then thawed before serving.